Guardian Insect Repellent - We Beat Deet™! Guardian is the safe and non-toxic alternative with plant-based respect for your body, your health, your children, and the environment. Guardian doesn’t have a chemical smell and doesn’t leave that sticky residue like chemical compounds that feel like you sprayed yourself with adhesive. Guardian’s plant-based formula is safe for use around your outdoor equipment. DEET, on the other hand, damages and corrodes plastics, nylon gear, and some clothing. JOIN THE MOVEMENT! - Choose from the Wilderness 8-Hour or Backyard 4-Hour formulas, each optimized for effective, safe repellency with durations matched to your outdoor plans. 1 when compared to 15% DEET products - see the proof here. A tough, reliable repellant for those whose playground is the outdoors. Camping, fishing, kayaking, backpacking, whatever adventure awaits, Guardian Wilderness delivers repellency with no compromises. 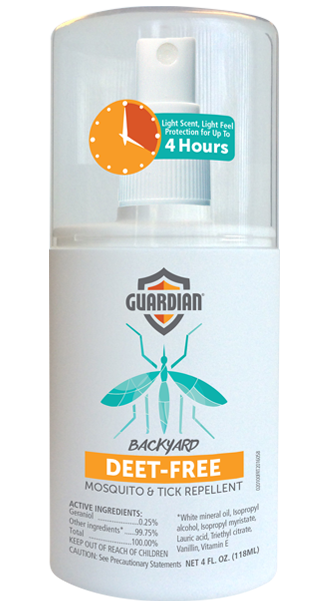 Guardian is a nature-derived, DEET-Free repellent as effective as 15% DEET against mosquitoes and ticks. Guardian Wilderness repels mosquitoes for up to 8 hours and ticks for up to 4 hours. See Guardian in action in this arm-in-cage test video. 1BBissinger et al. 2014 J.Med. Ent. Guardian is non-toxic and can be safely re-applied as needed. Feel confident using this DEET-Free, plant-based formula with proven efficacy. Ask your health care provider before using on children under 2. View Full Label Read The Reviews Buy Now! Summer is made for backyard barbecues, enjoying the garden, picnics in the park, and running through lawn sprinklers. Guardian Backyard lets you delight in warm weather bite-free with a lighter scent and lighter feel than Guardian Wilderness. Guardian Backyard repels mosquitoes and ticks for up to 4 hours. Same repellency as Guardian Wilderness, with a lighter feel and shorter duration.